At the Colonial Relays hosted by the College of William & Mary, several Wildcats posted impressive times. Bogdana Mimic (pictured above) won the 5000 meters by 33 seconds in 16:22.81, the 9th fastest time in the NCAA so far this outdoor season. 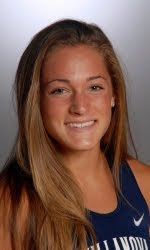 Her teammate Ariann Neutts pictured below), known primarily as an 800 meter specialist, moved up to 1500 and won in an impressive 4:25.36, the 12th best outdoor time in the NCAA. Two Villanova women set meet and stadium records. Ali Smith won the 3000 meter steeple in 10:34.34, placing hert 12th on the NCAA performance list. Vaulter Ashlyn Llerandi, VU's school record holder, got over a 4.00 meter bar and won the event. Other noteworthy results: Brooke Simpson was 4th in the 1500 in 4:2.75, Sarah Morrison, Kaitlin O'Sullivan, and Meaghan Smith went 5-9-10 in the 3000 meter steeple. The 4 x 800 teams of Browne-Mimic-Simpson-Neutts came second narrowly. On th e men's side, Dan Lewis was second in the 3000 steeple, in 8:56.00.